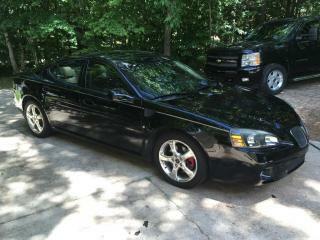 Just picked up an 06 GXP, located in the Charlotte, NC area. Looking forward to learning more about these cars here. Longtime motorhead and mechanic by trade. Welcome! We don't have too many LS4 owners around here. Thanks, mine's a very nice one. One owner, garage kept. Has 158k on it, had the trans overhauled at 120k. I can't find a flaw with it. Love this car. Welcome! Any pictures of your GXP to share? Yeah, I have plenty, haven't examined how to post them on this forum yet. I'll get to it eventually. Welcome! X2 on the pictures. ..
Ohhh pretty! Are those PowerStop calipers? Not sure. All 4 rotors are drilled though and it has gobs of brakes. They look like stock GXP stuff to me. Welcome, to elaborate on digital outsider gxp came with cross drilled rotors and red painted calipers from factory. When the time comes i'd stick with the delco drilled rotors and pads. I did a full hawk motorsports brake job and have been fighting rear brake squeek ever since. Welcome! That's a great looking GXP...I always liked them in black.